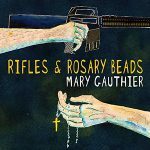 Congratulations to Mary Gauthier whose album Rifles & Rosary Beads has been nominated in the Album of the Year category at the 2018 Americana Music Association Awards. The album, which was released back in January to critical acclaim, features eleven songs co-written with and for wounded veterans as part of the five-year-old SongwritingWith:Soldiers programme. You can find out more in the video playlist below and read some excerpts from the reviews. Rifles & Rosary Beads is available now from Propermusic, Amazon, HMV, iTunes, Apple Music, Spotify and all good music retailers and services. The Americana Honors & Awards Show, takes place at the Ryman Auditorium on September 12, 2018.